🙂 If i was a duck, i would! Thanks for thinking of me. I’m not sure I’ll be able to get it done! Yes, the water is a tad bit cold! Great photo, but with the flooding in Florida, where we are headed in 4 Days, it’s kind of eerie. I bet it is! We have had more than enough rain of late. And more to come. Oh mine, Sandy! It reminds me of the photos I took in NC after hurricane Katrina. The water came up to half of the stop sign pole! This lake is in one of our city parks. It is part of a flood mitigation system. It floods with heavy rains to prevent problems elsewhere. I see. It’s good to have such system. Our area is very close to a system like that so we don’t have flood problem! Yes, good planning pays off! Yes, we feel secure living close to the flood control system! I like this photograph a lot. Where you chose to place the bench and its relationship to its surroundings. As the viewer I am aware of how my experience, feelings, the stories that are inspired change depending on where I Imagine the bench being placed. I am left wondering if you took several shots with different bench placements and if so what was it in this one that spoke to you and made you decide to choose it? I did take several shots of the bench. 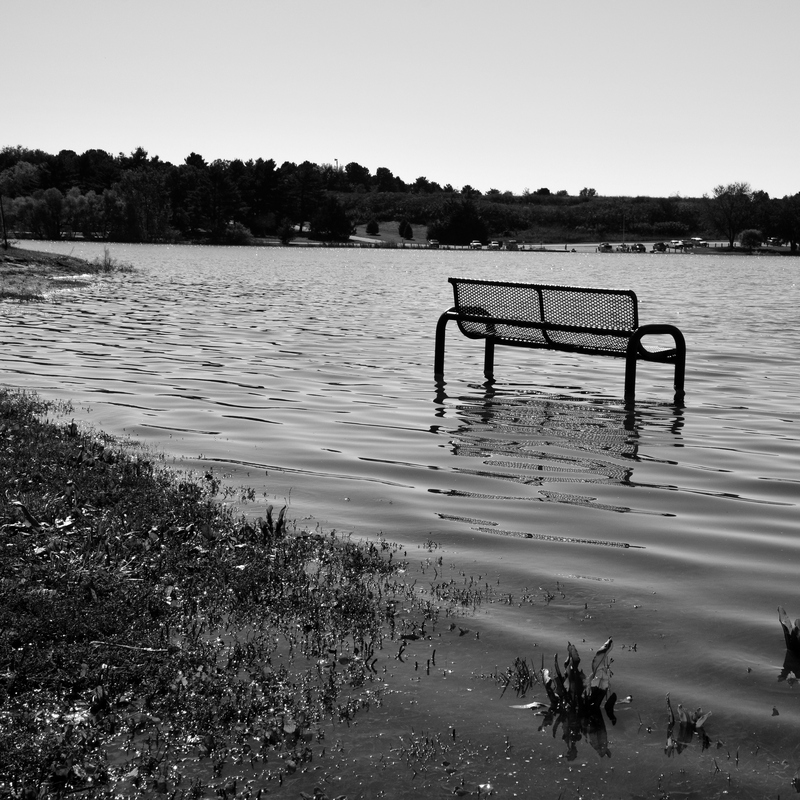 I chose this one because it gave a more expansive view of the lake, so you know the bench isn’t right by the shore. I liked the off center placement and the overall marooned feel this image created. This shot seemed to put the bench best in context literally and emotionally for me.